Building Notes: The original wood frame building was constructed in 1845; architect Lt. M.C. Meigs, Fort Wayne. When they outgrew that building they tore it down to build a new church on that site. 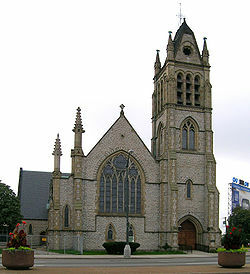 Since they needed a Church for services in the interim they built a Chapel first (dedicated in 1861 and designed by Gordon W. Lloyd) to use for services. When the Church was completed it included the Chapel. This Chapel, built in the shape of a red cross, is part of the present building. 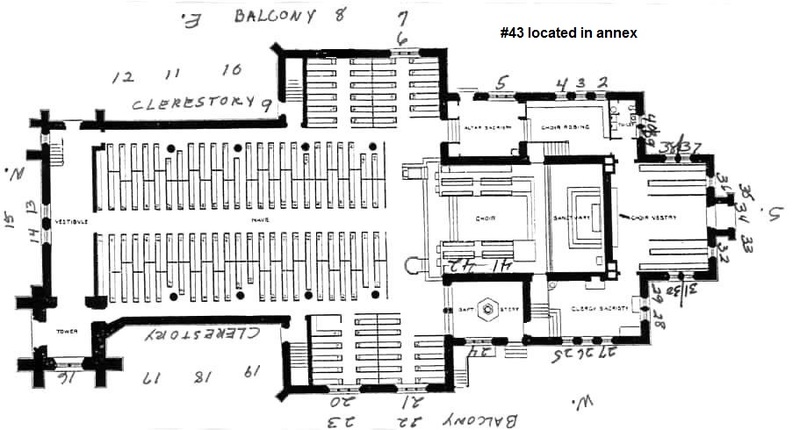 On the church floor plan the transepts of that chapel include the windows 2,3 and 4 and 25, 26,27. The nave of that chapel extends into what is now the Chancel of the Church. At the turn of the century, they extended the sanctuary into the nave to included the choir in the Chancel. This is standard for monasteries and Anglican Churches. They also constructed the Baptistery. Both were finished in 1903, architect unknown. This construction rendered the Chapel unsuitable for a worship space. What is left of the Chapel became the Vestry (windows 25, 26, 27), the Sacristy (windows 2,3,4) and the Choir Room. The last change was to move a window to create a door to access an annex. A couple of other windows were moved to better align the window's themes with the way the areas are used. For instance the St. Michael window was moved to St. Michael's Chapel. Although it required no construction other than rearranging some pews, the geographical west transept became the site of the St. Michael's Chapel during WWII.